As a proud dude ranch in Wyoming, we are excited to offer you a week of western fun to enjoy the spectacular and vast beauty of the Wind River’s East Fork Valley and surrounding area. This is the true west where the legends of the Wild West were created: Buffalo Bill, Jim Bridger and the Mountain men, the Arapahoe and Shoshone Indians, Lewis and Clark, Sacajawea, Chief Washakie, the Pony Express, and the Oregon Trail. Discover an old arrowhead while on the trail! The scenery while riding is superb. The Shoshone National Forest and the Wind River and Absaroka mountain ranges surround us. This is some of the most diverse terrain imaginable. Red rock and sand-canyon draws lead you up onto high plateaus and the possibility of sighting wild horses. Ride along the cottonwood river bottoms and tall rangeland grasses into colorful badland country. 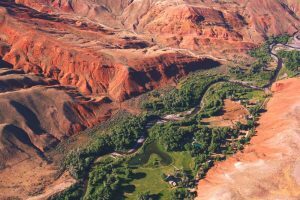 Experience the beauty of a Wyoming dude ranch among mountain meadows and alpine country, where early and late in the season you may see herds of elk, deer, moose or coyotes. The ranch is about 2 hours from Jackson Hole airport and 1.5 hours from Riverton airport. 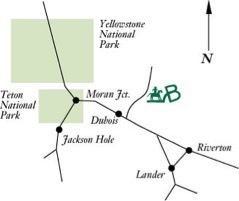 We’re located just 1.5 hours from the entrances to Teton and Yellowstone Parks. Drive west on Hwy. 26 approximately 67 miles to the US Forest Service Rd #277 / East Fork Road. You will see a large wooden sign that reads Trial Lawyers College, and a small Lazy L&B Ranch sign. Important: If it is raining, do not use the main drive way. Use the alternate entrance which is one mile further on the right. Drive down the hill, turn right at the bottom of the hill. Do not cross river. Continue along the bottom of the hillside to the ranch.